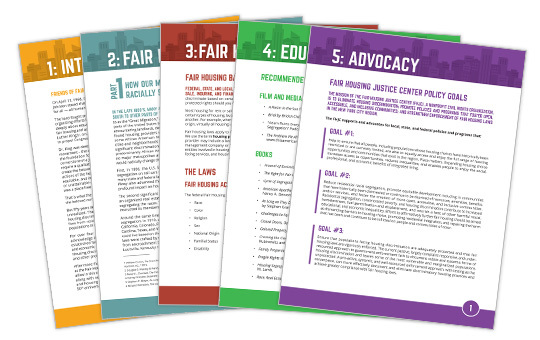 When we first thought about how we could engage people of faith to effectively advocate for fair housing through this initiative, we realized that a guide about fair housing, past and present, did not exist. Therefore, we created this Fair Housing Toolkit to assist diverse faith communities to promote fair housing and create more open, welcoming, equitable, and inclusive communities. This toolkit can be used as an educational resource about our nation’s history of segregation, current fair housing issues, and fair housing rights. The toolkit also identifies way in which people of faith can become more involved in promoting fair housing. Our hope is that this toolkit will empower diverse faith communities to help us build the beloved community. We will add more content to the toolkit as we learn about additional resources and tool that could aid religious congregations and faith communities to advocate for fair housing. We will also be translating this toolkit into Spanish and Mandarin later this year. Please be sure to check this page over time to get access to these additional resources. Sign up to become part of the Building the Beloved Community’s Interfaith Action Network. Find out about the latest fair housing news and ways that you can advocate for fair housing in your community. Success! Thank you for your support.